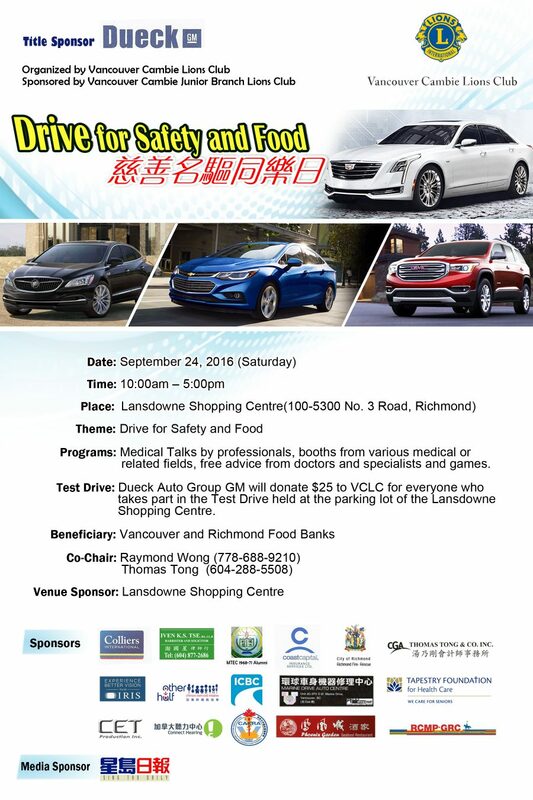 Once again, the Vancouver Cambie Lions Club held a Test Drive for Safety and Food event on September 24th, 2016 at Lansdowne Shopping Centre in Richmond, BC. 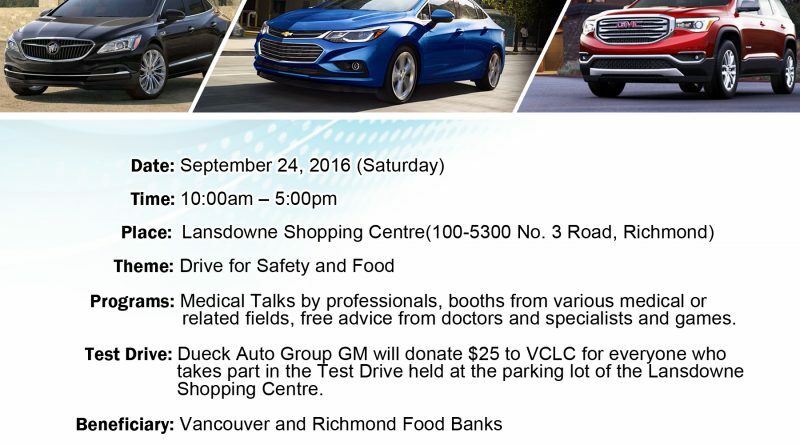 For every test drive, Dueck (GM) will donate $25.00 towards the food bank. Over 100 friends, supporters and people with a kind-heart come to support the event. Thanks to the staff of Dueck GM and all volunteers, the event is a big success! There are also a host of safety and health information booth inside Lansdowne Centre during that day. See photo gallery of this event on Facebook. Co-chair PP Lion Raymond Wong has sent a beautiful piece of thank you email to all members. Thanking almost every single person involved in different areas of the event. It is worth posting. Menjou/May always putting and devoting so much time and effort for every club events, we must thanks to them for organizing the man power schedule , recruiting test drivers (a lots), helping out as test driver assistant.Over look what is happening on site.Their effort make a big different with our result of magic number of 105.I like to propose to all event chairs, do not let them loose with help for your coming events.They always make things different and surprises with result. (even playing MJ). IPP Vivian has done a fabulous job with the event for the booth dept.again, she has spent countless time and effort helping poster design, arranging event promotion, organizing government officials,medias,newspaper and Omni TV,setting up stage, helping youngsters for the future of VCLC (CB),she made the event very professional.Do not loose her participation with all up coming events. Thomas is a very busy guy too, and likes to keep us thinking what he is doing with the event next,I found over the years we need to have patience to work with him (just like dealing with our Government,HA!Ha! ), he knows what is going on, he came out with all details at the right time and right place. Roger also extremely busy with work (dance), when he showed up, it makes the event more active and putting effort helping out, he and Queenie has invited lots of friends for the event and both helping out the whole afternoon. We must thanks to Johnny, he recruited many youngsters volunteers to help our events , his family showed up for test drive and Rachel as our club branch members took the major role as first aid attendant. As always, our Jeremy has taken so many nice pictures for our events , and I have believed part of the reason why “who has stopped the rain”, may time when we have social gathering with Jeremy, he always pray to the God before our dinner and he always wishing us for good. I cannot say anything to our Charter Presidents, he kept his promise showed up with four beautiful ladies and most important he has introduced to me (Ha!Ha! ).Thanks to his effort. Thanks to Kevin came with friends,although after month long vacation and with jetlag and loaded with work to catch up.Excellent member spirit. Thanks to Beverly and her sister and two young beautiful youngsters stayed until event ended and helping to clean up all the garbage, took down signages, tent, making sure before they left.They deserved a certificates too. Miranda came with her sisters for our event and returned after dropping them off at the airport,stayed till last minute . For those members who cannot come, I truly think they have prayed with their heart for our event. Thanks to Emillie with his Raymond and friends for supporting and she has stayed late helping out til last minute with us. 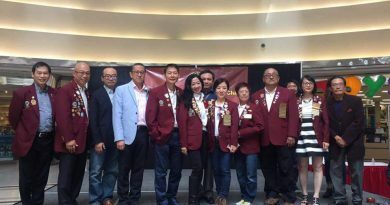 We have few heavy weight Lions from Lions Int’l who came supporting our event with (coffee, donuts from Hans Wong and Clara), (cash contribution from Queen of BMW),Polly,Simmon,Shella,Laurance. On behalf of all Event Co-Chairs, thanks you all very much.If I have missed anyone , i am sure May will remind us. One last thing, we must thank to our Volunteer Ben San, she has started and finished til the test drive ended,due to budgeting for the event, on behalf of VCLC, I have gave her an award “BIG BIG KISS” already . All the best to VCLC 2016-2017.